How many times is enough? Are you stopping too soon? There is a very simple principle which applies to learning almost every physical skill. Repetition. 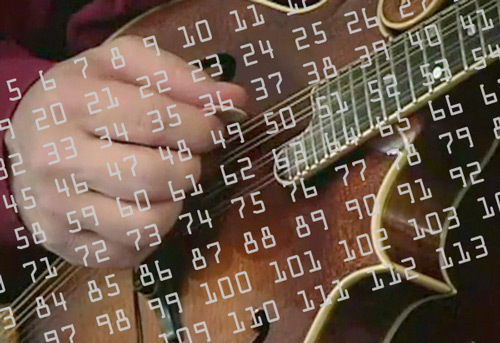 When you sit down to practice something such as a new chord progression, a banjo lick, a mandolin tune, etc., how many times do you repeat it? Most people, me included at times, simply don't repeat the "thing" enough times to reach that magical breakthrough. A problem which plagues many students is failing to repeat something enough times to become really good at it. It is easy to become bored with playing the same thing over and over and over. It is tempting to play something a few times and then move on to something else. Choose a scale, a tune or part of a tune, a roll... something you could stand to improve. Go through it a few times and be sure you know what you are trying to do. Which fingers should you use? Which pick direction? Now, and this is hard part, play it 500 times! Yes, it will get boring. Yes, it will be monotonous. But you are going to notice that your playing begins to change. After the first 50 repetitions or so you will have the "thing" memorized and you'll begin to run on auto-pilot. As you pass the 200-300 mark your subconscious begins to take total control. As you near the 500 mark your body will have found the way to play with very little conscious effort on your part. Instead of counting you could set a timer. Do a little math and see how long it takes to play the "thing" 10 times. Then just calculate how many minutes it will take to make 500 repetitions. If you give up half-way there that's okay! Maybe you ran out of time and had to head out the door to work. Just start over again tomorrow. You should, in the early phases (during repetitions 1-100), pay close attention to HOW you are playing and feeling. Be aware of any unwanted tension that develops and go slow enough to prevent that. Try to find a nice, easy groove that just feels best to you. If you begin to hurt physically or get tense, pause. Rest a bit. Keep track of where you are in the journey to 500. Go for a walk. Feed the dog. Sip some water. Stretch. Then, pick up where you left off. For some things it may be better to do 10 reps, take a 1 minute break, then 10 more, another 1 minute break, etc. until you reach 500. I hope you get my main point here. Lots of people never achieve the level at which they hope to play simply because they stop practicing before they hit that auto-pilot, almost hypnotic trance state of practice. Try it and see if it helps. Getting really, really good at that one "thing" will help all of your playing. And next time you can play a different "thing". Maybe go for 1,000. This article appeared in my free monthly email from June, 2017. If you'd like to subscribe for free and get similar tips and discounts on my learning materials just hop over here and sign right up. Have fun and happy picking!